Description: New England Central's colorful history, covering from 1995 to the present. Description: New England Central's power at Brattleboro. Title: NECR 3015 approaching the CSX interchange. Title: NECR 3015 does work at the CSX interchange while an westbound empty ballast train approaches. Title: NECR 3015 switching the CSX interchange. Description: I personally like this scheme although it doesn't even come close to the old blue and gold NECR scheme. Description: NECR southbound 600 switches the south end of the yard along "Railroad Row" in White River Junction, Vermont. Todays train consists of GP40-2W 3015 and 12 cars of mixed freight. Description: Under watchful eyes, NECR southbound 600 switches the south end of the yard along "Railroad Row" in White River Junction, Vermont. Todays train consists of GP40-2W 3015 and 12 cars of mixed freight. 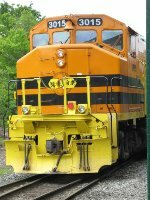 Description: NECR southbound 600 switches the south end of the yard in White River Junction, Vermont. Today's train consists of GP40-2W 3015 and 12 cars of mixed freight. Description: NECR southbound 600 backs towards the yard at the South Siding Switch in White River Junction, Vermont. Today's train consists of GP40-2W 3015 and 5 centerbeam flats. Description: NECR 611 passes power sitting in the yard NECR Palmer Yard. 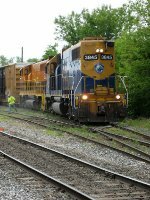 Title: NECR 3850 and NECR 3015 work the CSX interchange. Description: On the right the autorack train can be seen getting underway after getting a new crew. Description: Personally I like the past scheme a lot better. Description: A bit of color here at WRJ, VT. Description: NECR now under Genesse ownership and the 822 on the 40th Anniversary train set. Description: New England Central 3015 and 3317, both wearing the G&W orange and black, wait at the CSX diamond in Palmer. Description: Third unit on 611 arriving in Palmer. Description: NECR southbound 500, the loaded Chip Train, passes the roundhouse in St. Albans, Vermont. Today's train consists of GP40-2W 3015, GP40CU 3809, and 23 loaded wood chip hoppers. To the right are SD40U 3405, SD45U 2674, and SD45U 2680.